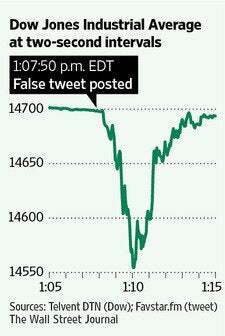 The market lost 200 billion (And mostly recovered) after a fake tweet yesterday. Sounds like our automated trading systems are quite vulnerable, eh? Amazing they are tuned to pickup and act on news like that without any human intervention. edit: i did a quick calc and at 140 characters (too lazy to count), that's 1.4 billion lost per letter, number, space, or symbol.